Not all the buildings on Grand Avenue have been turned into galleries or cafes or boutiques. Some of them have been around for years, and they’re happy just the way they are, thank you very much. Once such establishment is Hermano’s Liquor & Market. 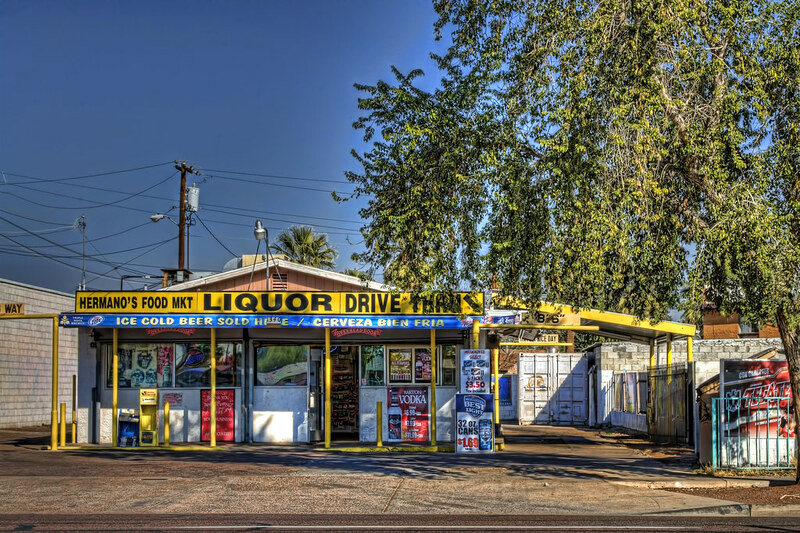 In the 2005 Phoenix New Times “Best of…” poll, Hermano’s was voted “Best Drive Through Liquor Store If You Lost Big”. I’ve never been a customer at Hermano’s, but I can imagine the typical clientele that probably frequent this business. I think they probably come out more at night. On a different note, I *finally* got a wireless remote for my Nikon. I started out with a cable remote which works fine as long as you’re within cable-distance of the camera. But I got tired of getting all tangled up with the cord when trying to get a shot set up on the tripod. The dang thing was not expensive at all and I have no idea why I waited this long to get it. I’m looking forward to using it for this weekend’s planned photoshoot in Tempe. This entry was posted in Equipment, Information, Shooting and tagged architecture, Arizona, AZ, beer, cable release, camera, D5000, drive-through, drive-thru, Grand Avenue, HDR, Hermano's, liquor, market, Nikon, Paint Shop Pro, photography, Photomatix, software, Topaz, tree, tripod. Bookmark the permalink.